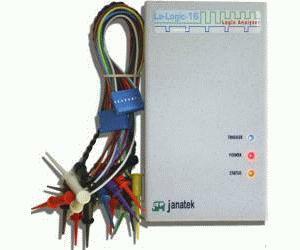 The La-Logic-16 is a sophisticated PC-based logic analyzer. It captures at a maximum of 200Mhz on its 16 channels simultaneously into its deep 1M samples/channel buffer. It can also operate as a 16-channel pattern generator. It connects to the PC via the USB-port and does not require any external power. The package is complete with all accessories included to start debugging immediately.